ANU has announced that the admissions process for domestic undergraduate students will change significantly from next year. Students will receive offers based on a combination of their academic results and community involvement, and the top 2% of students from all Australian secondary schools will be automatically eligible for conditional offers. Students will apply in March-May 2019 for Semester 1 2020 entry, with early offers released in August. The offers will be conditional, however, with students needing to meet a minimum ATAR and community involvement threshold before the conditional offer becomes guaranteed. Conditional offers will be given on the basis of Year 11 academic results, and meeting the community involvement threshold before the close of applications. These offers will be confirmed when final results are released at the end of the year. When asked about the early offer date, Deputy Vice-Chancellor (Academic) Marnie Hughes-Warrington said that it would help students transition to life at ANU and make any necessary arrangements. “It is unique because we’re unique. We’re the only national university and we are really the only residential university. So if you’re getting your offer in August you’ve got more time to get used to the idea of transitioning from home,” she said. She said that students who missed the early deadline could still apply as normal through UAC, but that it was “technically possible” that all spots may be filled in the August early offer round. Students will submit a single (free) application for admission, accommodation, and scholarships combined, through a university system with software provided by the Universities Admissions Centre (UAC). Hughes-Warrington told Observer that while this would necessitate a longer application than the standard UAC, it would ultimately save students a lot of time and effort. “You don’t want to stress the year 12 students out too much, and you also don’t want to give too much work to careers advisors and schools,” she said. ANU-affiliated colleges John XXIII and Burgmann will be part of this system, as well as the ANU-owned residential halls. The Tuckwell Scholarship will remain a separate application, but all others will be available through the general application. Hughes-Warrington said this would significantly improve the accessibility of these, and also that the University had “identified some funding that was sitting dormant” to create additional equity scholarships. Students will receive their conditional acceptance, accommodation and scholarships simultaneously in August. These skills are intended to highlight the “employability and well-roundedness of students”, but will not replace bonus points, or impact other entry requirements, such as their ATAR. A wide variety of co-curricular activities will be considered, from E-Sports and tabletop gaming to rugby to debating. Hughes-Warrington told Observer that there would also be scope for students to explain other activities that may have been left out. ”If students are really passionate about what they do then you should let them be passionate. That’s how they’ll make friends, and that means a broad spectrum of people coming into the university rather than a particular group of people who’ve got a particular interest,” she said. ANU has created a calculator for the co- curricular and service threshold. Based on this, a student could meet the threshold by having a part-time job or having caring responsibilities alone. Hughes-Warrington told Observer that this section of the application would be something of an honour system, with students affirming they have told the truth rather than having to provide evidence. “At the end of the day, if you want to get the relationship with ANU off to a good start then you will be honest with us… and provide evidence that’s appropriate”. However, she said the University would conduct “random audits” of applications to verify information. 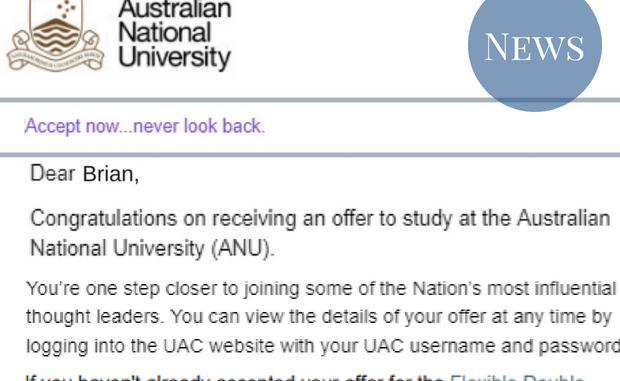 The National Group- The top 2% or top three students from every school in Australia will be given a conditional offer for ANU, if they meet the academic and co-curricular /service threshold, and apply to ANU. This is the first time such a system has been offered nationally, and is based upon the Texas state system, which offers places to the top 10% of students. The High Achievers Group- Places will be offered to these students after the National Group and Priority group. Conditional offers will be made to students on the basis of ANU selection rank, “in order of merit” – that is, in order of ATAR/ATAR equivalent (including bonus points), provided students have met the co-curricular/service threshold. Offers will be made in this group until places are full or there are no more students meeting the requirements. Any additional places will then be given to students applying through the usual UAC system. This system will currently only be open to students who are undergraduate domestic school leavers. If the system works well, however, Hughes-Warrington said she would like to see it extended to other groups, starting with international undergraduates. “We want the whole university to be on board with this,” she said. A forum open to students and staff will be held on 1 June to discuss the new initiative.